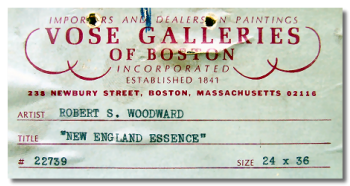 RSW- Artwork page, "New England Essence"
Sold while on loan by the Vose Galleries to the High Museum, Atlanta, GA. S. Morton Vose was RSW's Boston agent and frequently sent his work about the country. See also High in New England to view related piece. See also the... Houses Gallery to view related pieces. See also Abandoned Heights to view related piece. 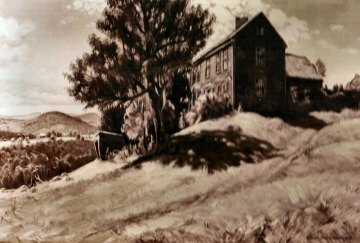 "Painted in 1943. A canvas made in the studio in the winter of 1943, from sketches in oil made a number of years ago. 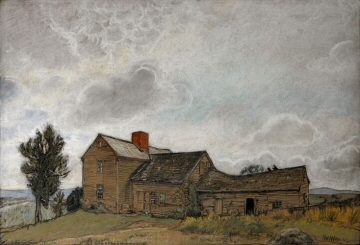 (Also made chalk drawing of this same subject, now owned by Charles Stoddard of Greenfield) of the quaint old house in Rowe, Mass (now demolished). 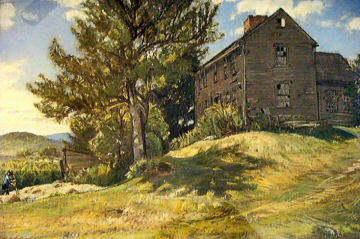 Have made several paintings in the past of this rare old house. 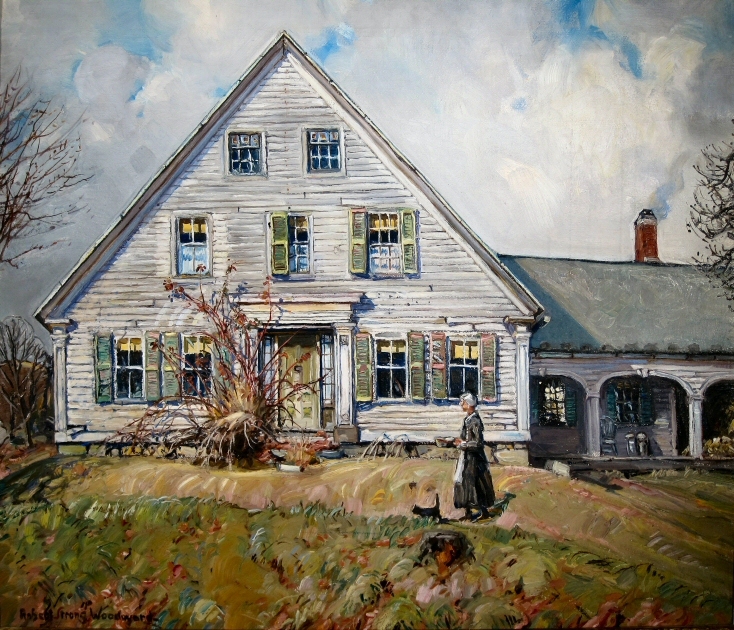 Sold by Vose Galleries in Atlanta, Georgia, April 1, 1947 to Dr. Amey Chappell of Atlanta, Georgia." Gallery label from the back of the painting. Dr. Amey Chappell was a prominent physican, a recipient of the 1967 Elizabeth Blackwell Medal given by the American Medical Women's Association, and a significant philanthropist to the Greater Atlanta area. There are three known scholarships in her name; she served as a trustee for both Piedmont College and the Emory School of Medicine as well as President of the Greater Atlanta YWCA. She is also credited as saving a church from closure with a generous gift. 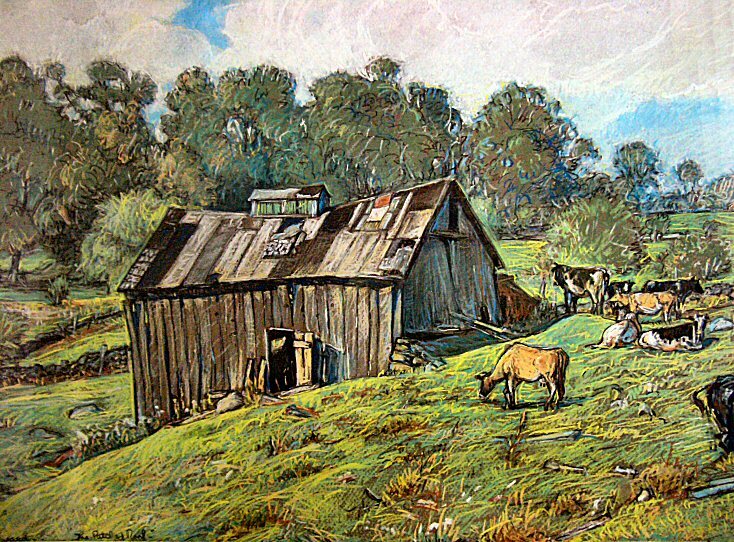 Dr. Chappell gave this painting to her cousin. It was then left to the cousin's son who auctioned it to a mid-western man for $3,151 in 2010. Above and to the right: The Vose Galleries (est. 1841) on Boyleston Street in Boston began representing Woodward in January of 1936 according to RSW's records and would for the remainder of his career. They served him very well, particularly in collaboration with museums and galleries around the country, such as, the High Museum in Atlanta, GA and the Dallas (TX) Museum of Fine Arts. 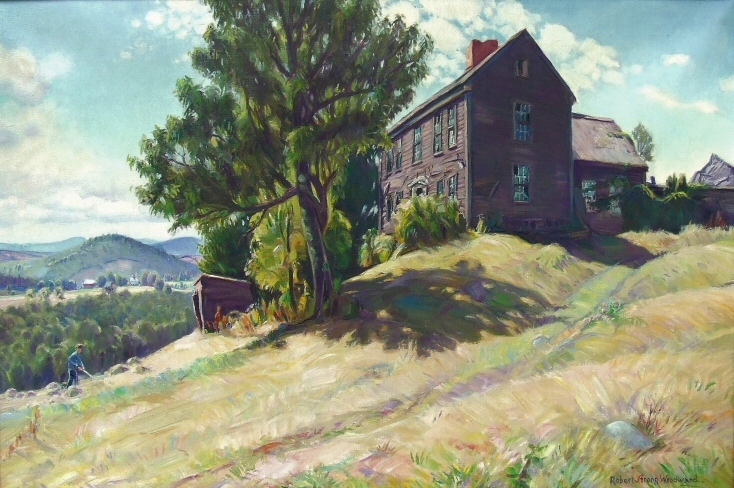 Below, the house featured in this oil painting was also featured in two known chalk drawings, High in New England and Abandoned Heights Click on either of the titles below, and it will page you to their respective page for a better look.